Balanced line input module converting Eurorack level signal to line level signal. 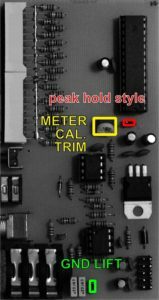 When an setting is changed then meter blinks with LEDs according to this parameter first (changing peak hold on/off blinks with most top LEDs, changing PPM, VU, RMS, AVG modes blinks LEDs next to panel marked letters, changing last LED indication blinks with last LED:) ) and then meter shows all current setting (most top LEDs for peak hold on/off, bar up to PPM/VU/RMS/AVG letters for bar mode or two or three LEDs next to marked letters for dot mode). So changed parameter LEDs blinks and then all current setting is showed for a while. Settings are memorized. PPM (peak program meter) and VU-meter are based on signal peaks (VU-meter with slower time-constants), RMS (root mean square) and AVG (average) modes are based on averaging/integrating RMS level of input signal (AVG with slower time constants) showing “averaged” signal level (“loudness”).